Columbus Circle in the 1890s must have dazzled the senses. The towering granite monument that gave the Circle its name was unveiled in 1892. On one side was the entrance to the carriage lanes and horse paths of Central Park, and on the other could be heard the “uninterrupted whirr” of the Broadway cable cars heading downtown, as Stephen Crane described it. Stylish electric street lights illuminated the Circle with globes of sunshine. The Theater District was now just blocks away to the south; the new apartment houses and townhouse blocks of what was still known as the West End were rising to the north. 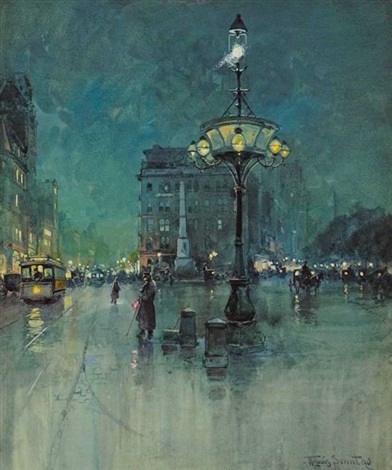 And a mostly forgotten artist named William Louis Sonntag, Jr. captured the din and dazzle in this painting, giving us a view of twilight at Columbus Circle on a rainy, magical night.